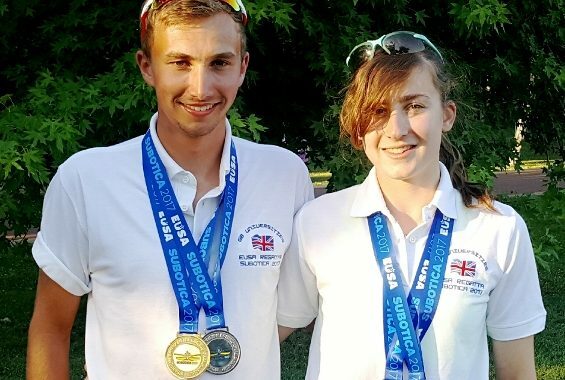 Due to a very successful British Universities & Colleges Sport Regatta in May, Stratford upon Avon Boat Club members Imogen North racing for University of Nottingham (gold medals in LW4-, LW4x and a silver medal in LW2x) and Franklin Hamilton racing for Reading University (gold in LM4x, bronze in LM2x and bronze in M4x) proudly qualified to race for the Great Britain university crew at the European University Sports Association Regatta (EUSA) in Subotica, Serbia recently. Franklin racing in the Men’s lightweight quad and lightweight double and Imogen also racing in the Women’s lightweight quad and lightweight double competed in the heats on Friday, beating tough competition to secure their places in the A finals on Sunday. This gave them Saturday to recover and watch the repêchage events. 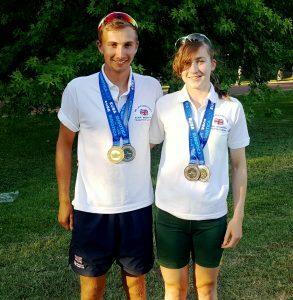 Sunday morning’s weather brought challenging racing conditions but Franklin and his partner raced a close final wining a silver medal in the LM2x just missing out on the gold by two seconds to the University of Vienna. Imogen’s LW4x then won a silver medal in another tightly contested race, gold being won by a very strong crew from the University of Amsterdam. As the day went on, conditions gradually became more challenging with gusts of high wind making tough conditions especially for lightweights. However Franklin and his crew went on to win a gold medal convincingly in LM4x beating top crews from Poland and Germany amongst others. One of the last races of the competition was the LW2x but even with waves breaking over the riggers, Imogen and her partner battled it out to win their second silver medal for the competition, a feat made all the more impressive because they are both first year students at their respective universities. ← Stratford Are Champs at Nat Champs!